Define reports, including all your views, segments, and custom dimensions and metrics. Preview results and build your analysis while you wait. Then, export them to databases and files with one click. Pull reports created on the Web or defined within Canvas and then write them to a single workbook or directly to existing dashboards and databases. A drag & drop workflow builder makes it easy work with datasets that are bigger than spreadsheets can handle. Query, clean, and prepare data without SQL. With an analysis complete, one click refreshes data, performs calculations, formats the results and updates your dashboards, reports and databases. 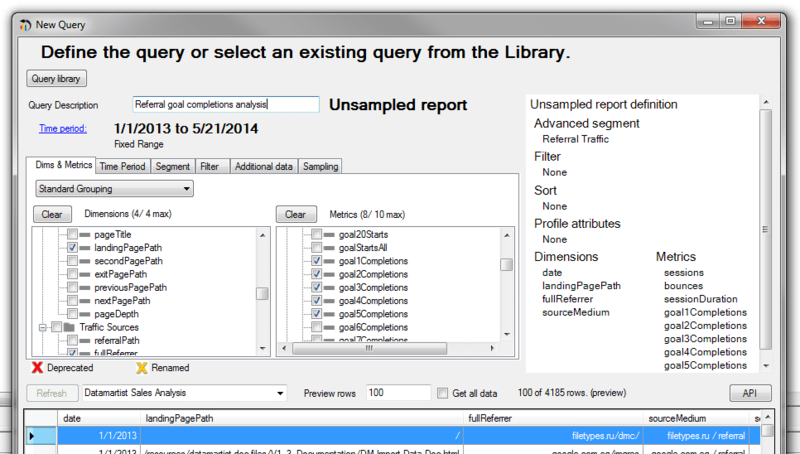 There are many ways to get unsampled data from Google Analytics. Analytics Canvas lets you access all of them. 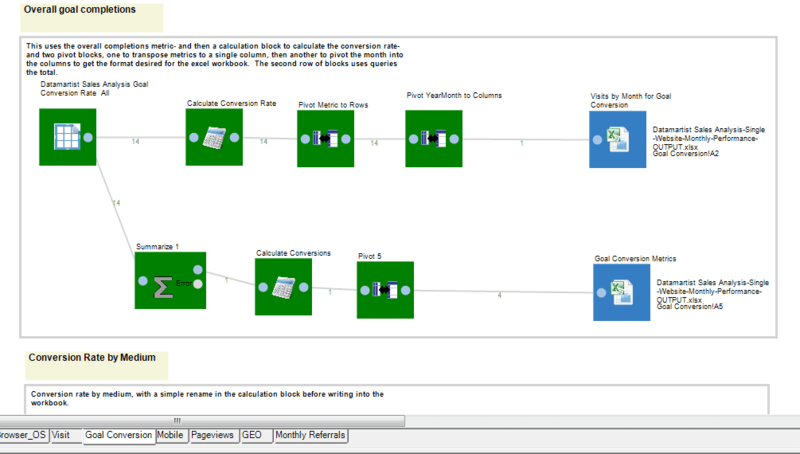 Dimensions and Metrics All core reporting 50 custom variables, 200 custom dimensions, 200 custom metrics. Some limitations, such as AdWords. Limited to raw hit and session level as per schema. Examples of not available: Geography, Adwords, Content Experiments, etc. No limit if paging 3 Million rows/query Billions. Setup No additional setup required. Create BigQuery account, submit request for extraction to Google. Analytics Canvas Enhancements Partitioning eliminates sampling where there are less than 500K sessions / day Full access to the unsampled reports API and a visual interface for scheduling and downloading unsampled reports. BigQuery SQL generation (beta). Reduce errors and get more in less time with a visual interface that automatically generates the complex BigQuery SQL. 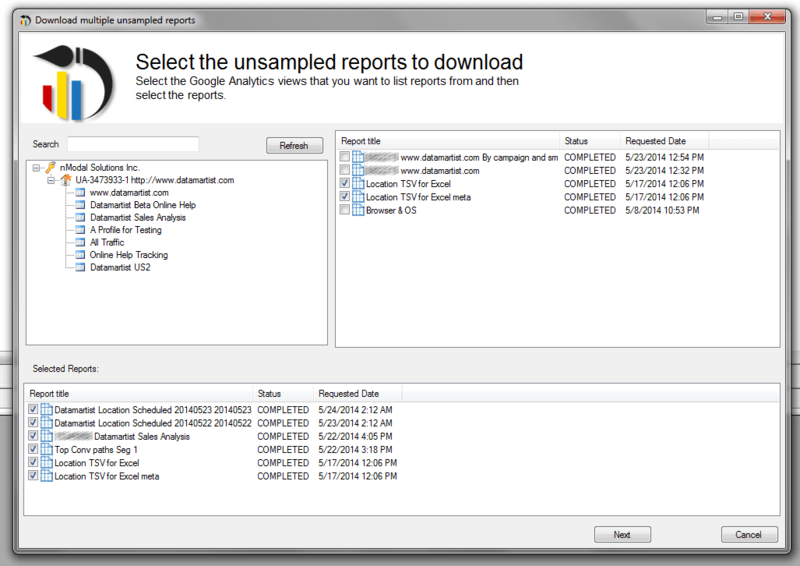 Do I always have to use the unsampled reports API? What if I just want to do some quick analysis? You can choose from one of three options: Only schedule unsampled reports when there is sampling detected, 2) preview the data so that you can start your analysis while waiting for the results, and 3) use the core reporting API and partition the results for higher precision. I don’t know SQL, how do I access my Google Big Query data? 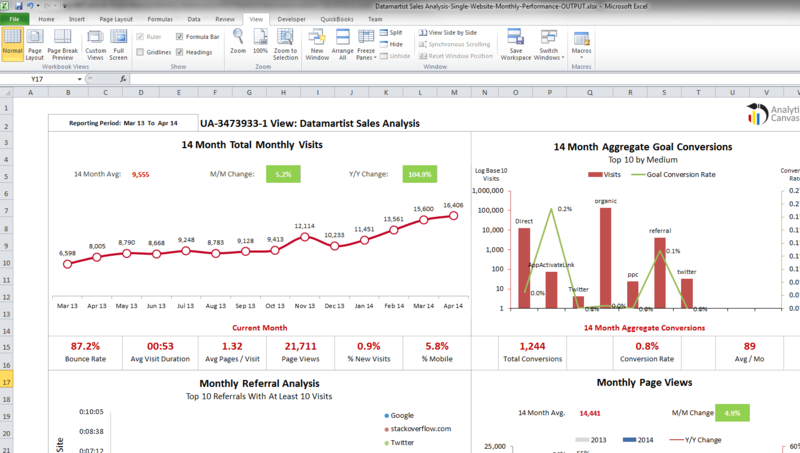 The visual query interface makes it easy to gain access to your data and start analysing it. Run complex funnel analysis and get hit level data by the second without writing a single line of code. Some of my accounts are Premium, others are not. Can I analyze them together? Yes. This kind of multi-part analysis is common among our customers. Data-blending with sales, CRM, social and other sources of BI is a core feature of Analytics Canvas and blending your data from Premium and Standard accounts is no exception. I’ve never used a tool like this, where do I start? Try our quick-start guide, review our getting started videos check out the example templates within Canvas or drop us a line and take advantage of our complimentary 1:1 demos and tutorials. We will show you how to connect to data sources, query Google Analytics and write your results to databases and files. Can I access my custom dimensions and metrics? You can query all of the valid dimension and metrics that Google makes available. For Premium accounts, this includes the 200 custom metrics, 200 custom dimensions and 50 custom variables. We have documentation and videos available in-app and on our website. As well, our friendly staff are available for web-conferences with you and your team to help you get up to speed as quickly as possible. Trusted by leading brands and analysts around the world.